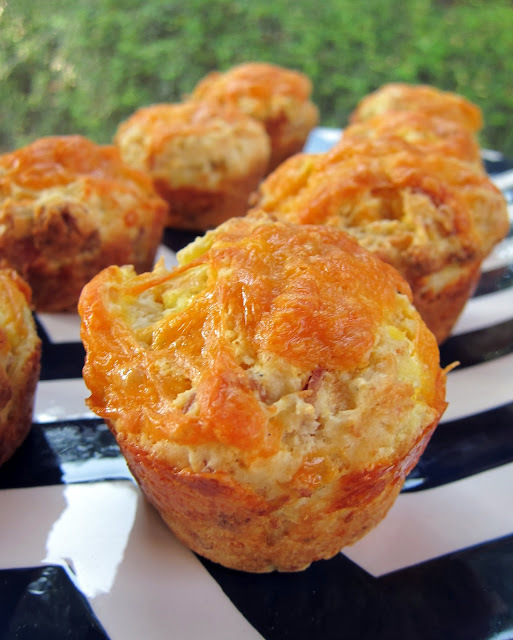 I saw these muffins on King Arthur's site last week. I thought they sounded interesting because they are made with scrambled eggs! I've never made muffins with scrambled eggs; I just had to give them a try. The muffins were great. They are packed full of cheese, bacon and scrambled eggs. These muffins are quick and easy to make, plus they freeze well. They are a great breakfast on-the-go! If you aren't a fan of bacon, feel free to switch it out with sausage or ham. You could also add some peppers, onions or whatever else you like! Preheat the oven to 400ºF. Lightly grease a 12-cup muffin pan. Coarsely chop the scrambled eggs and bacon. In a medium-sized bowl, stir together the flour, baking powder, salt, dry mustard, and black pepper. Stir in 3/4 cup of the cheese, the cooked eggs, and the bacon. Whisk together the milk, oil, and egg. Stir the liquids into the dry ingredients just until blended. Divide batter evenly among the muffin cups. Sprinkle with the remaining cheese. Bake the muffins 20 to 25 minutes, until lightly browned. I make a similar version all the time. They're so handy for busy work weeks! These sound amazing. Too bad it is so late at night- otherwise I might be tempted to make them now! This will be a great thing to make and have in the fridge or freezer for a quick grab on a busy morning, can't wait to try them. I've got some in the oven right now, can't wait to see how they turn out! What would be the best way to reheat these from fridge or frozen? Sarah V - I just pop them in the microwave. Made these for a snow day breakfast. Very yummy and filling. More of a biscuit texture. Thanks! I would cook them first, but either way should be fine. and do the scrambled eggs need to be cooked before hand?? To clarify - the eggs are scrambled, cooked in a frying pan then added to the batter? I hope that's right as that's how I made them. They came out delicious! I threw in some sauteed onion and extra bacon. This recipe is definitely a keeper! I have made this recipe several times and really enjoy it. Thanks for sharing it.